More about Läkerol Salmiakki Licorice Läkerol Salmiakki Licorice Sugarfree Pastilles offer intense Scandinavian salmiak flavor and work as a sugar-free throat lozenge. The lozenge slowly dissolves and the cravable flavor lingers, sweetend with Stevia plant. 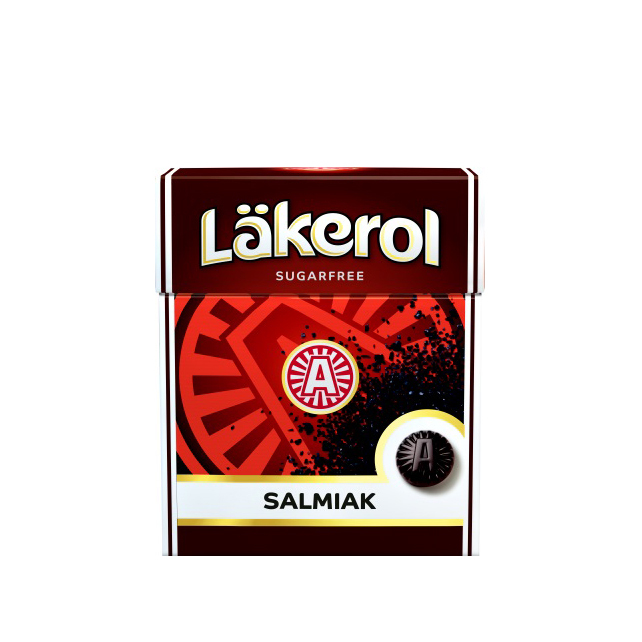 Each sturdy flip-top cardboard container contains approximately 26 salmiakki licorice lozenges. Ingredients: Sweeteners (malitol syrup, sorbitol syrup, steviol glycosides), stabilizer (gum arabic), licorice extract, ammonium chloride 6%, salt, lactic acid, palm and coconut oil, natural flavorings and artificial flavorings, glazing agent (caranuba wax). salmiak licorice is a matter of taste, You either love it or hate it, I LOVE it! These are pungent salmiakki flavored pastilles. My absolute favorite! Product as advertised with fast service. I will reorder soon. I only ordered one box of this licorice since its description indicated it was both strong and salty. I like milder licorice candy but I was wary of this product, but still thought I'd give it a try. I've had a similar Dutch licorice that was overpoweringly strong and salty; almost impossible for me to eat. The Lakerol Salmiak licorice, however, is pungent and a bit salty, but it's a curiously intriguing and pleasant flavor. I'll be ordering more of it. Lots of flavor in such a small size! I had never had these licorice candies before and thought I would give them a try. Boy, was I surprised! So much flavor in such a small little piece of candy. You'll love them! I expected more of this one, like real salmiakki you buy in Finland, and it was not quite that, but was ok and refreshing. This is very popular in Scandinavia, but it is an acquired taste. I have always liked licorice, but the salty taste makes refreshing combination. The Salmiak variety is flavored with ammonium chloride, which is stronger than table salt. Some people think it has mild medicinal effects, but the flavor is reason enough.